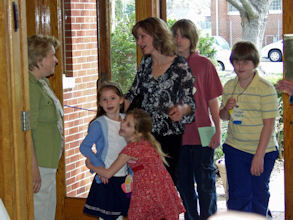 This year we are celebrating 10 years of bringing Unitarian Universalism to the Dover area. If you are unfamiliar with Unitarian Universalism, you will experience a wide range of spiritual and intellectual thinking and a variety of relevant and interesting topics. We are warm and welcoming and enjoy introducing visitors to our diverse and liberal faith. We extend a special welcome to UUs who are new to the area. Your experience and knowledge can help us grow. If you are interested in joining our mailing list or learning more, please contact us! We affirm the worth of each individual, honor the democratic process, and respect individual freedom of belief and free faith which is inherent in the Unitarian Universalist heritage and its seven basic principles. For more about our denomination’s beliefs, principles, and history, please check our page About Unitarian Universalism. UUCD’s auction is our biggest fund raiser of the year. We will have a silent auction of items and services donated by members of the congregation and local businesses. We will also have a live auction for “experiences” – dinners, beer and wine tastings, vacations, etc. Dinner and light beverages will be served. The event will be held at Christ Church. To purchase tickets in advance, please email treasurer.uucd@gmail.com.